This is a blog post I’ve been meaning to do for a long, long time. 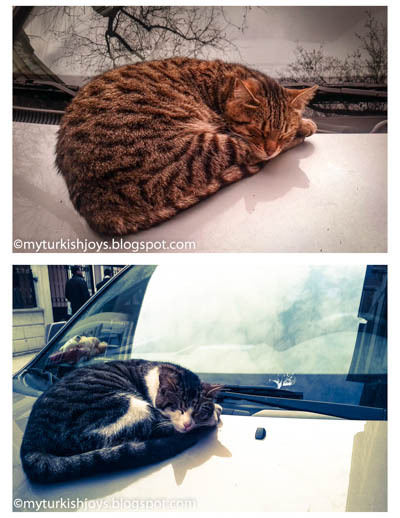 For the past three years, I’ve collected more than 100 photos of the street cats of Istanbul. If you live here or have visited here, you can’t help but notice these furry felines everywhere. And I do mean EVERYWHERE! I’ve spotted them hanging out in Ayasofya as well as the Chora Church as you’ll see below. I’m actually more of a dog person, but even I can’t resist these friendly cats, except when I’ve had one or two beat at my legs because they wanted food. 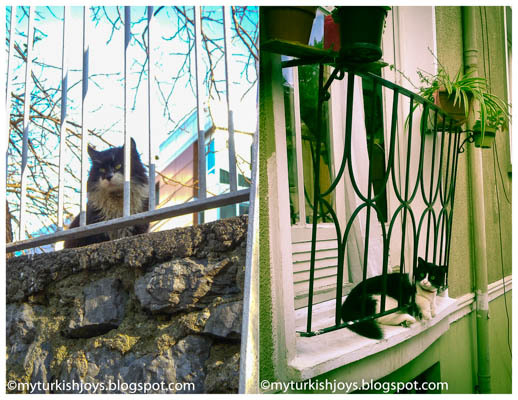 I’ve posted about the street cats before in two neighborhood posts which you can find here: The Cats of Çukurcuma, and here: The Cats of Büyükada. In this post, I’ve been trying to learn some new photo editing techniques using Adobe Lightroom 4. I’ve finally figured out how to make diptychs using this handy tutorial on Jay Watson’s Photography blog. Now, I can pair two images side by side, giving me more room to show you more photos here on the blog. Diptchs kind of showcase a mini story in one. Awesome! 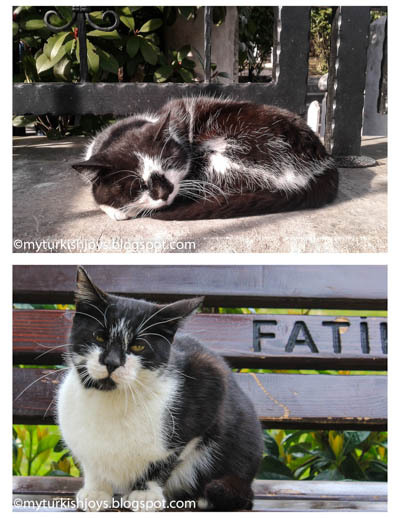 What do you think of the Istanbul street cats as diptychs? Left: Ayasofya. Right: Blue Mosque. 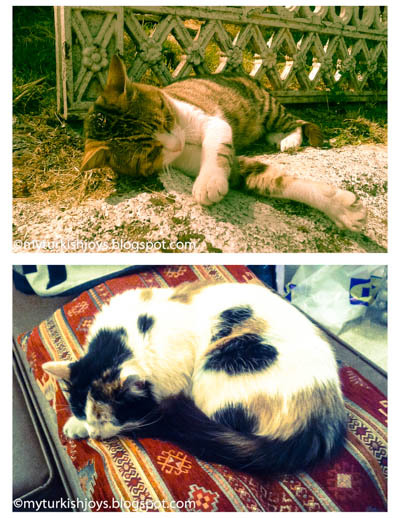 Bottom photo: The infamous Callie the Cat over at my friends' place: Denizen Coffee in Sultanahmet. Top photo: Cat seeks solitude in one of the many hans in the Grand Bazaar. 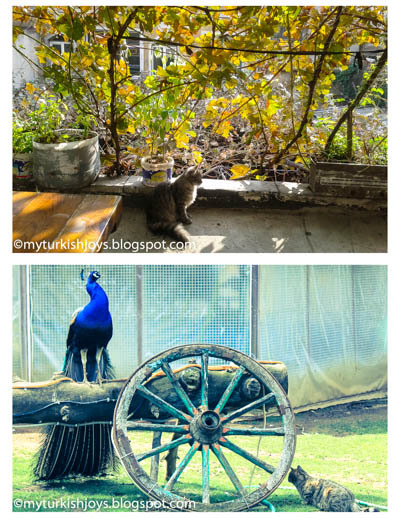 Bottom photo: Turkish cat attempts to 'capture' the peacock in Yesilyurt. Great photos. 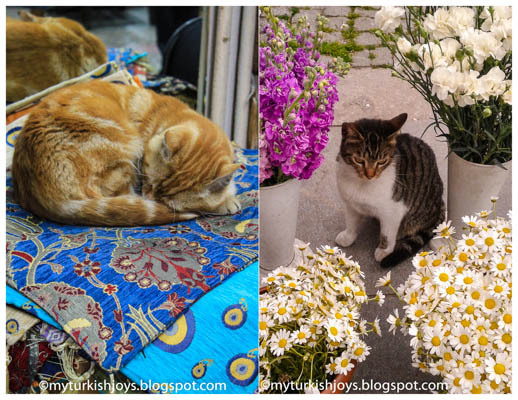 I loved the cats of Istanbul and my favourites were the collection who hung around on the wharf near the ferry departure on the Asian side (waiting for fish scraps I think) and several I saw curled up on stacks of carpets outside shops. I have never been anywhere else where I have seen so many cats! @Julie, me neither! 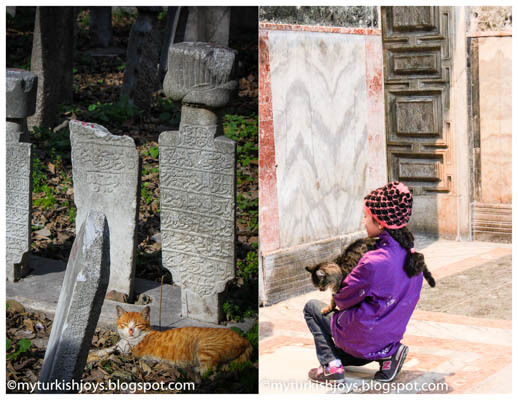 I could have done several posts about the street cats in Istanbul, but these were some of my favorite photos. Cheers! I love the pictures but am struggling with the reality of too many street cats. We have about 30 around our Bodrum house and the flees they bring in are making Jake's life a misery. Despite the potions and collars he wears, they have to bite before they die and every day he's getting bitten to pieces. Nothing makes me happier than seeing a bunch of street cats taking any and all opportunities to sneak in a nap. Great photos and thanks for the shout-out!! Look out for the street gnomes in Poland! @Annie, Oh dear! Well, that doesn't sound like fun! I watched a documentary about a village in Siberia along the river, and they make a tar/syrup from boiling bark from birch trees. Then, they use this as bug repellent on themselves and on their animals bc the bugs bite so bad when the snow all melts. Crazy! i bet the peacock won! we have lots of ferel cats here and they drive me crazy. they use my gardens as litter boxes. teddy keeps most of them at bay! @Barbara, which color is your favorite? Thanks! Love these pictures, especially of the peacock and the cat... I have peacocks around my neighborhood and they co-exist peacefully with my three cats, even if my boy cat wants to catch a peachick! When I was at the Spice Market, I was impressed that a fish vendor tossed a cat some fish. Yes, there were a lot of street cats, but none of them seemed to be starving. They looked healthier than the street cats of Jordan and Egypt! Thank you for these pictures! Love them! @Jane, Happy to hear you like them! I swear this cat was just waiting to pounce on the peacock. I doubt he/she ever would've been able to though. I'd love to see a peachick! How adorable! I love how the cats will just curl up and sleep on anything. I wish I could take them all home! 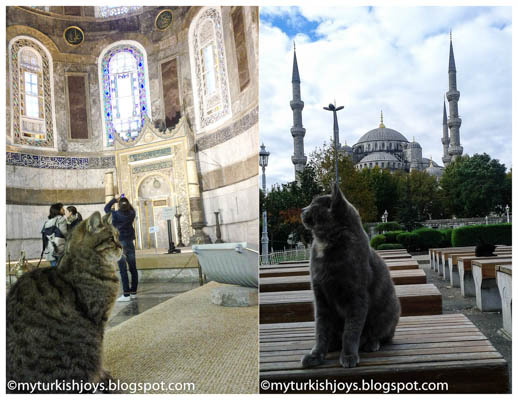 I think I have a pic of the same cat inside Aya Sofia! Great pictures! @Jess, so cute, aren't they?